Test your scientific knowledge with this comprehensive card deck. My grandson loves this...He is very smart and into science. Absolutely the perfect gift. Six year old grandson has a passion for learning. After learning all the states, their capitals, and precise locations, he learned all the countries of the world, their capitals, flags, and precise locations. Now he is learning the Elements on the Periodic Table. When he saw the box of cards, his eyes lit up and he began reading each card aloud. The whole family was engaged! It's so "Elementary" but every teen needs these. Is useful and cards will be frequently handled. Mary "the best gift giver"
Helpful guide and very interesting. My daughter's upcoming chemistry class was a little daunting, but she seems intrigued and inspired with the cards as many things she already knew and some that surprised her. She read all the way thru after opening. We are installing the set on a giant wall in our playroom. Can't wait to see it finished! Our 12 year old grandson has the periodic table poster on the wall by his bed. He wears his periodic table shirt periodically. We thought he might enjoy this suggestion by his mother. He was quite surprised when he opened his gift and began going through the cards. I had to call customer service about one of the rings. I had a great experience with customer service and can't wait for the new ring to be shipped so my grandson can enjoy it with his twin brother. I would buy these cards again. They are fabulous! 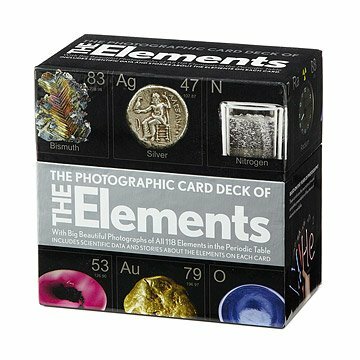 My son saw these element cards on your website. I got them as a a Christmas present. They are even better than described on the website. One side has a photo of the element and all the info about where it is located on the periodic table, its atomic weight, number of electrons, etc. The other side has info on how the element is used, etc. These cards are great for kids as well as adults! My grandson's birthday is not until Oct. 17th, so have no idea how he will like this; but assume that since he is so interesting in everything that he will love it. I'll let you know. This was a gift and my niece loved it!